The perfect winter pattern whether you are at the slopes or just bundling up on your walk to work is fair isle. It's a pattern that reminds you of hot chocolate and long underwear. 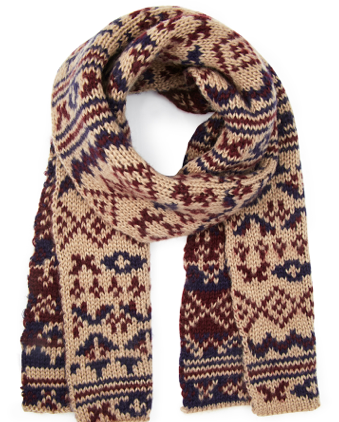 Today we're looking at fair isle scarves. A wool blend that will keep you warm. I really enjoy the mixing of the blues. Who doesn't love a great snood? This cozy knit is going to go with any winter jacket and add the perfect amount of pattern. A nice camel color with a fun fringe detail. 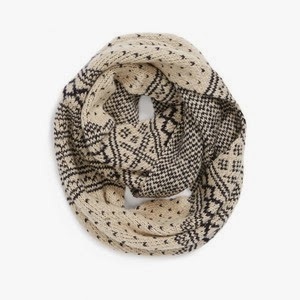 Kind of an Aztec inspired print that you can wear two ways! Fair isle is the perfect print for the dead of winter. 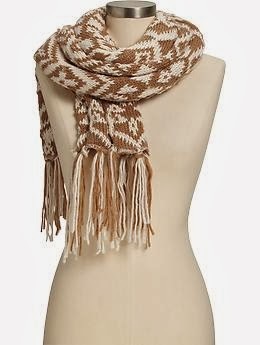 Mix it up with a cozy scarf instead of the sweater and keep your outerwear fresh!